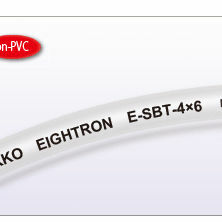 E-SBT is a five-layer tube, designed for ink-jet printers. It is more flexible than the conventional ink-resistant tube. This product is a higher-grade version for solvent-based inks. It shows higher ink resistance of inner and outer layers. The middle layer is composed of barrier resin, so compared with a tubing without barrier resin, the value of dissolved oxygen remains low. This means that E-SBT is a high gas barrier tubing, resulting in low evaporation of inks. Thus, ink ejection irregularity or clogging are less likely to occur.